For as long as I can remember, my two favorite holidays have been Halloween and April Fools' Day. I was born on April 15th, so maybe I am an April Fool. But even if I am, for many years I took this day very seriously, planning and executing elaborate media-based hoaxes. I stopped a few years ago, but I'm not sure why. Maybe I simply got bored. Maybe it became too easy -- or too hard -- to be believed. Maybe I thought I might get into real trouble. My day job is boss of www.AbleComm.com -- a company that sells Panasonic phone systems. I also own some Panasonic stock, and I review Panasonic electronic products. Starting in the mid-1990s, I distributed an April Fools "news report" about a mythical press conference that took place at a non-existent hotel, where fake people announced fake corporate policy changes and fake new products. It became an eagerly awaited annual tradition in the telecom business. Lots of people loved it, but believers, of course, did not. In 2007 I produced a masterpiece about Panasonic owning the "VoIP" trademark (Voice of International Panasonic) and seeking royalty payments, or injunctions against such companies as AT&T, Microsoft and Cisco for using the term without Panasonic's permission. They, and most of the world, use "VoIP" to mean "Voice over Internet Protocol," a system for using the Internet for phone calls. The spoof did get some media coverage, but its circulation was limited by the tell-tale 4/1 date. For 2008, I decided to celebrate the holiday a couple of days late to improve my chances of success. Early on Thursday April 3, 2008 I launched a 90%-false press release through PR Newswire -- the same company that Panasonic used for its news. The press release contained several revelations, but the most important was that Panasonic would be manufacturing cellphones with plasma video displays. Back in January of '08 Panasonic demonstrated the world's largest plasma TV, so now I thought they should also have the smallest. Through very lucky timing, a few days before my news went out, AT&T had announced their Mobile TV service for watching shows and sports on cellphones, which added usefulness and legitimacy to my fictitious device. Within a few hours, the story was picked up and published by websites around the world. Many news writers added original material to demonstrate their extensive knowledge of the subject; but only one of them called me to check on the story, and I told him that it was a spoof. Mobileburn.com was particularly fanciful in enhancing the fake news (but I'm not sure if they were being playful or stupid). They said "Panasonic took the stage at CTIA 2008 this week with partner AbleComm to announce that it has been working with AT&T to develop plasma displays for mobile phones, for use with the carrier's new Mobile TV service." There was absolutely nothing in my news about an appearance at the CTIA event or Panasonic "working with AT&T." The closest I came was that the new plasma displays were "for cellphones to use with" AT&T's service. 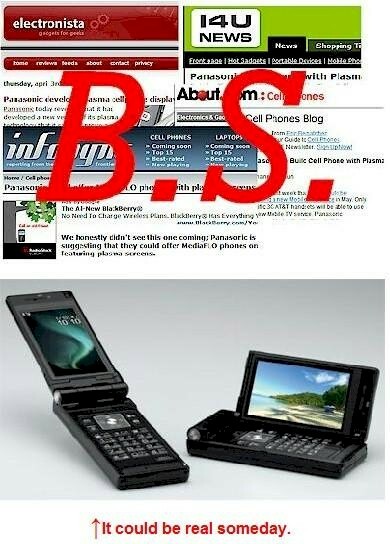 Crunchgear.com had a headline that read, "AT&T wants Panasonic to develop plasma screens for cellphones." I never said that, and I doubt that AT&T did. Several websites, such as Mobilemag.com stated that Panasonic "will be offering cell phones" for the AT&T service. AT&T had previously announced that their service would use cellphones made by Samsung and LG. If someone read carefully, he or she might conclude that Panasonic would be supplying displays to either or both of those companies, or for another company. But very few people read carefully. My news release said that Panasonic had licensed technology from AbleComm. Some websites twisted this and reported that AbleComm would be making plasma display screens for Panasonic. I never said that AbleComm makes anything. As a clue to its falsehood (which is part of April Foolery tradition), my press release said that a key event took place on Tuesday. Some experienced writers recognized the day as April 1, and knew the news was not to be believed. Many others got caught. Some laughed. Some didn't. As in the past, reaction within Panasonic was mixed. There was some laughter, some grumbling, and some snarling. One outraged exec sent a email saying that I caused "people to loose (sic) thousands of productive working hours." Maybe he needs a new calculator. Perhaps Panasonic was talking to its lawyers, but a lawsuit would only mean more fun for me and bad publicity for them. I assume common sense would prevent them from from taking me to court. After all, I said only good things about the company, and it would be hard for them to prove any loss. Even more importantly, they'd certainly lose in the "court of public opinion." A few hours after the news went out, I authorized an official retraction through PR Newswire, the same service that sent out the original press release, but the original news has continued to circulate and expand. Because of the trouble I caused, I was banned for life by PR Newswire. That banning is the prankster equivalent of an Oscar. Now I use PR Newswire's competitors. Haha. Some websites that received the retraction accused me of forgetting what day it was. One humor critic said it was a "late, poorly executed April Fools joke," and another called me an "April Idiot." Actually it was not late, and it was extremely well executed, and my mother didn't have any stupid kids. There's certainly no rule that limits hoaxing to one day per year. No one who was filmed for TV's Candid Camera on 3/20 or 10/15 objected because it wasn't 4/1. Similarly the celebrities who were victims on the MTV show Punk'd may have grumbled, but not because they were not punked on the first day of the fourth month. And the subjects of "Stuttering John" interviews on The Howard Stern Show didn't check the date before deciding to participate. I was born in April but I'm not an April Idiot. I was smart enough to write the phony news in a certain way, and send it on a day, that increased the likelihood of its publication. I am not the idiot. I wasn't "punked." I didn't publish a phony news story on my website. Some victims were at least partially complimentary. Dailytech.com said "Yesterday AbleComm sent out a press release that was all very believable talking about how Panasonic was going to be using small plasma displays in a mobile phone designed to be used on the new AT&T Mobile TV service launching in May. The release was professional, interesting and all very plausible replete with quotes form Panasonic and all. It didn’t take long before the story was all around the internet with posts on Engadget, Slashphone and more. As a freelance guy I posted the story myself at some other publications." Some websites were actually suspicious of the retraction. Phonemag.com said it "Looks like someone let the plasma cat out of the proverbial bag too soon, and is now desperately backtracking to try to salvage a business relationship. It’s unclear whether this was a deliberate or accidental occurrence, though the release was sizable and contained multiple quotes from all the parties involved which lends weight to the idea that it was an authentic document prematurely distributed." GOTCHA! Many of the websites that ran the news of the retraction, but had not run the original fake news, ran it with the retraction, thus increasing the circulation and readership of the spoof. GOTCHA again. We know that "truth can be stranger than fiction," and over the years some of my April fictions later turned out to be true. A few days after I announced the fictional Panasonic plasma screen cellphone, I learned that Panasonic has a REAL cellphone being sold in Japan (photo above) designed for enhanced viewing of mobile television.